A simple shuttle ride from the highport of Marduk to the planet's surface ends in disaster when raiders strike the system. Struck by a missile, the shuttle crash-lands in the wilderness. far from civilisation. With night falling and no prospect of immediate rescue, the Travellers will be forced to seek shelter in nearby ruins where they discover they are not alone. In Marooned on Marduck, the Travellers will have to deal with the other survivors of the shuttle crash, whose reactions to the situation may cause more problems than they solve. 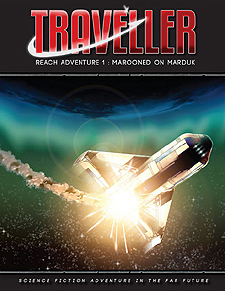 After braving natural hazards of Marduk and making contact with a band of locals who are also hiding in the remains of what used to be a proud city, the Travellers will come to realise they are being hunted by raiders who want to enslave them for their technical skills.